As a web designer I spend a lot of time online and Google continues to make those online hours easier. They have recently introduced iGoogle which allows users to personalise their searching experience and create a talyored interface with user defined content. I have the feeds from my favorite blogs, bookmarks to expediate my work process, St Louis weather forecast and a spell checker. The variety of “stuff” you can add to your home page is huge, tools such as a translator, windows short cutes, a To-Do list, feeds, joke of the day ….the list is endless. 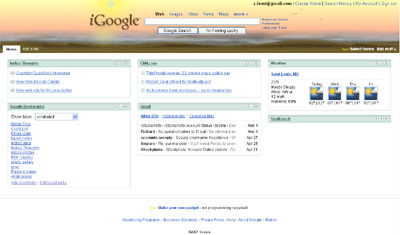 iGoogle also offers the opportunity to add a theme to your home page. I selected beach …a dynamic theme in which the sun moves throughout the day mirroring the position of the sun at my Zip code! There is also a bus stop theme which matches your local weather.